I primarily see the poems in this collection as my struggle to find faith, sanity, and light in a world often veiled in shadows and darkness. Though many of these poems were born in shadow, hopefully, as a whole, light breaks through. 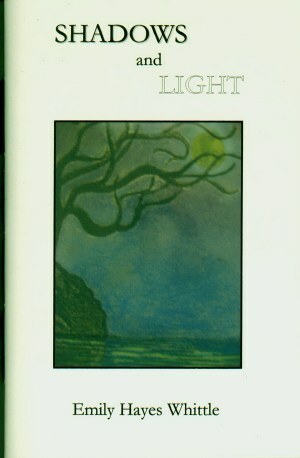 I find light for my path through poetry, my family, and my Celtic Christian and American Indian spiritual inheritance. Emily Hayes Whittle is a poet, mother, grandmother, and great-grandmother. She fell in love with poetry and the natural world as a child, began writing at an early age, and is an avid reader. She was born in Maplewood, Missouri, worked as an LPN in her youth, and began college when her three children were in elementary school. She currently lives with her husband in Reading, PA. Her poetry has been published in various literary journals including American Writing: A Magazine, Kalliope, Passager, Poetic Page, The Awakenings Review, and several of her poems have been translated into Japanese and appeared in three bi-lingual editions of The Plaza (Tokyo). bearing away the furniture of her childhood. as my small head rose above the white water….